7 July 2016, at 6:00a.m. 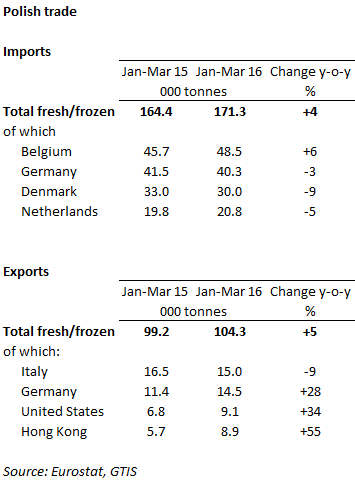 POLAND - Polish exports of fresh and frozen pork recorded a 5 per cent increase in the first quarter of 2016 on a year earlier, to 104,000 tonnes. Both EU and non-EU countries saw a growth in shipments from Poland. Polish domestic production has recorded a decline over recent years, so to support growing export volumes, Poland has been importing a significant number of finishers from other member states. Indeed this volume has increased by 7 per cent during Q1 2016 on a year earlier, to 1.5 million head. While there was a small decline in exports to Italy (-9 per cent), shipments to Germany, the United States and Hong Kong grew significantly (by 28 per cent , 34 per cent and 55 per cent respectively). During the first quarter of 2016, imports of fresh/frozen pork also grew on the year earlier, up 4 per cent to 171 thousand tonnes. Much of this growth was due to increased shipments from Belgium, while Germany, Denmark and the Netherlands recorded falls in their shipment levels. As well as for domestic consumption, a proportion of this imported pig meat is also intended for further processing and subsequent re-export. Much investment has taken place in the meat-processing sector, where volumes are growing steadily, particularly exports to the United Kingdom and Denmark.